Discussion in 'B4J Tutorials' started by Erel, Nov 9, 2016. FontAwesome and Material Icons are two free icon sets including more than 1500 icons. They are implemented as regular font files which means that each icon is a regular character, exactly like any other Unicode character. Only fields that use the FontAwesome or Material Icons font will show the icon characters properly. Starting from B4J v4.70 / B4A v6.50 / B4i v3.50 they are integrated in the IDE. It is very simple to use the icons. 1. Set the control's font to FontAwesome or Material Icons. 2. Open the icon picker. 3. Click on an icon. It will be copied to the clipboard. 4. Paste it in the FontAwesome or Material Icons field. Click on enter to set it (or switch to a different control). Note that you can leave the icon picker open and use it with other controls. You can also use the icons in your code. - Right click in the code editor and choose Icon Picker. - Click on an icon to copy it to the clipboard. Make sure that the control's font is set to the correct font. The IDE will automatically add and load the relevant font file based on the font usage (in the designer). - FontAwesome font include the standard latin characters. You can combine the icons with text. - Material Icons only include the upper case characters. Kiffi, MarkusR, calsdn and 29 others like this. Great and when it comes in B4A? It will be included in the next updates of B4A and B4i. mehr+shad, pesquera, corwin42 and 4 others like this. @Erel on next update can you please add a function (add font) in b4j? 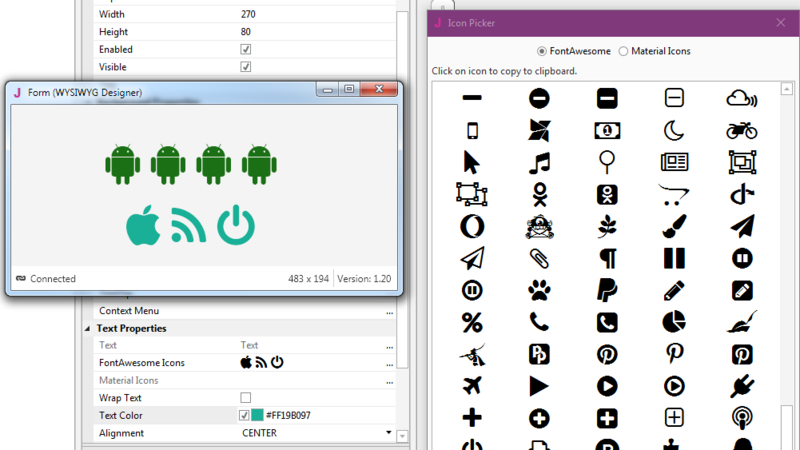 for now i can add fonts with add files button on designer, but i cant use the font added. on b4a i can add and use, only on b4j i cant do this. example: i m added ubunto-regular.tff but i cant see this on font. on next update can you please add a function (add font) in b4j? This is not the right place to post wishes. From the aspect of productivity this is a real timesaver. victormedranop and Erel like this. Starting from B4J v4.70 / B4A v6.50 they are integrated in the IDE. I am sorry that my IDE (B4A Beta #1 6.50) is different. I cannot select the font nor the icons. Please help! I am using B4A Version 6.50 Beta #1. My Virtual Designer is different. Make sure to set the Typeface to FontAwesome or Material Icons. For further discussions please start a new thread in the questions forum. Great improvement on B4A! Now it´s very easy to add more life on apps! Any news for the b4i implementation ? It will be added in the next update of B4i. in my version 6.50 beta, there is no "text property" for buttons ?!? Thanks for helping an amateur out ! Mashiane, priusfan, Erel and 2 others like this. How fast is to developer in b4x, this comunity it's amazing.